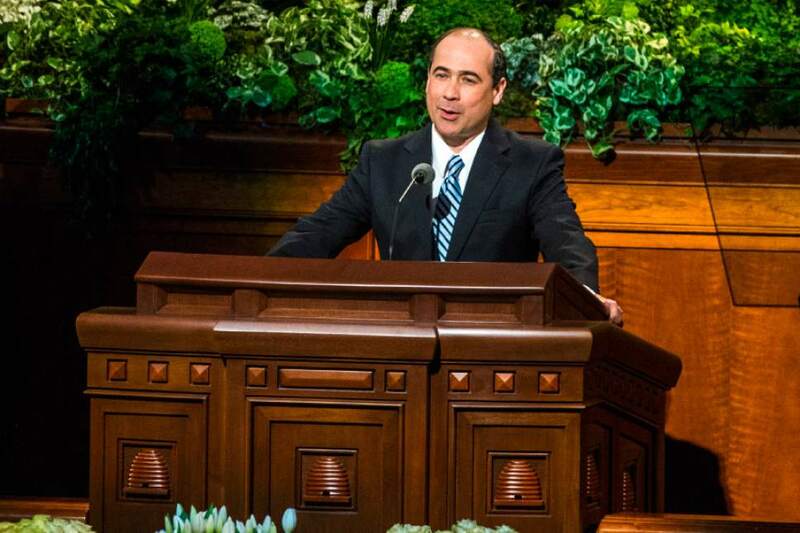 Holland, others condemn bigotry; Monson's chair vacant in afternoon, but he addresses priesthood session. Chris Detrick | The Salt Lake Tribune Conferencegoers before the afternoon session of the 187th Annual General Conference at the Conference Center in Salt Lake City Saturday, April 1, 2017. Chris Detrick | The Salt Lake Tribune Conferencegoers before the afternoon session of the 187th Annual General Conference at the Conference Center in Salt Lake City Saturday, April 1, 2017. Chris Detrick | The Salt Lake Tribune Brook P. Hales, Secretary to the First Presidency, speaks during the afternoon session of the 187th Annual General Conference at the Conference Center in Salt Lake City Saturday, April 1, 2017. 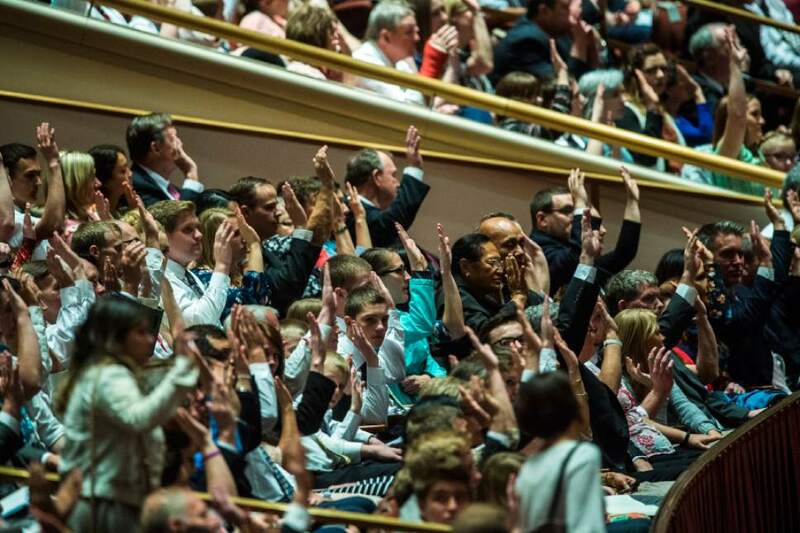 Chris Detrick | The Salt Lake Tribune Members affirm a vote during the afternoon session of the 187th Annual General Conference at the Conference Center in Salt Lake City Saturday, April 1, 2017. 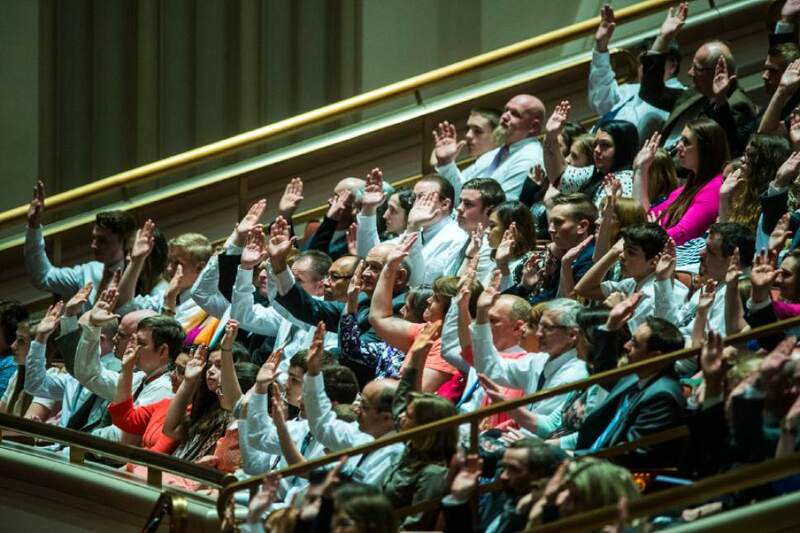 Chris Detrick | The Salt Lake Tribune Members affirm a vote during the afternoon session of the 187th Annual General Conference at the Conference Center in Salt Lake City Saturday, April 1, 2017. 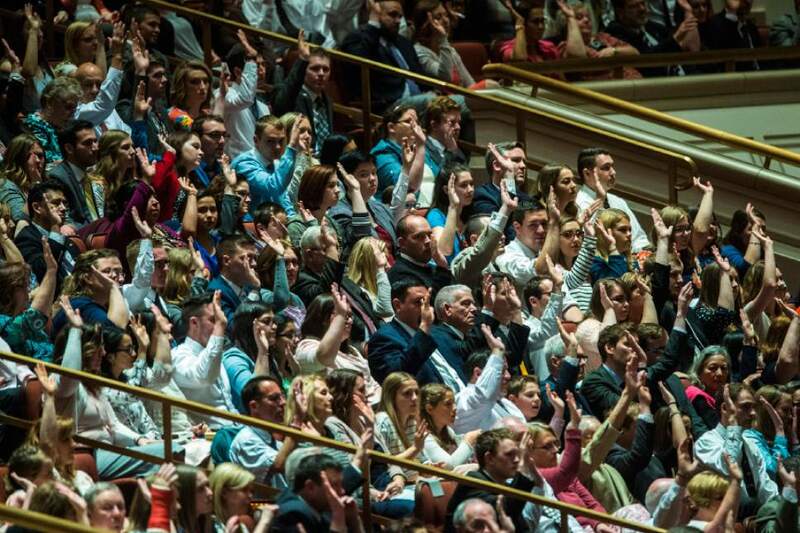 Chris Detrick | The Salt Lake Tribune Members affirm a vote during the afternoon session of the 187th Annual General Conference at the Conference Center in Salt Lake City Saturday, April 1, 2017. Chris Detrick | The Salt Lake Tribune Kevin Jergensen, Managing Director Church Auditing Department, speaks during the afternoon session of the 187th Annual General Conference at the Conference Center in Salt Lake City Saturday, April 1, 2017. Chris Detrick | The Salt Lake Tribune President Henry B. Eyring, First Counselor in the First Presidency, speaks during the afternoon session of the 187th Annual General Conference at the Conference Center in Salt Lake City Saturday, April 1, 2017. Chris Detrick | The Salt Lake Tribune President Henry B. Eyring, First Counselor in the First Presidency, and President Dieter F. Uchtdorf, Second Counselor in the First Presidency, arrive during the afternoon session of the 187th Annual General Conference at the Conference Center in Salt Lake City Saturday, April 1, 2017. Chris Detrick | The Salt Lake Tribune Elder Gary B. Sabin, General Authority Seventy, speaks during the afternoon session of the 187th Annual General Conference at the Conference Center in Salt Lake City Saturday, April 1, 2017. Chris Detrick | The Salt Lake Tribune Elder Valeri V. Cordón, of the Seventy, speaks during the afternoon session of the 187th Annual General Conference at the Conference Center in Salt Lake City Saturday, April 1, 2017. 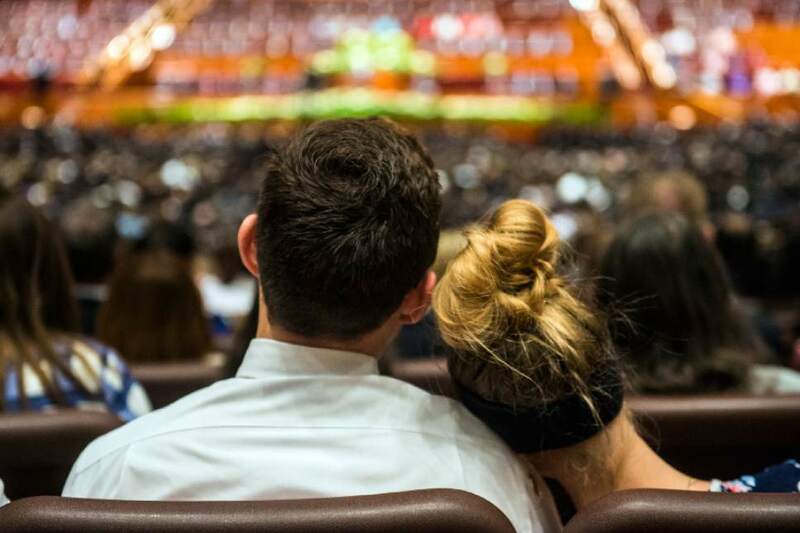 Chris Detrick | The Salt Lake Tribune A couple cuddles during the afternoon session of the 187th Annual General Conference at the Conference Center in Salt Lake City Saturday, April 1, 2017. 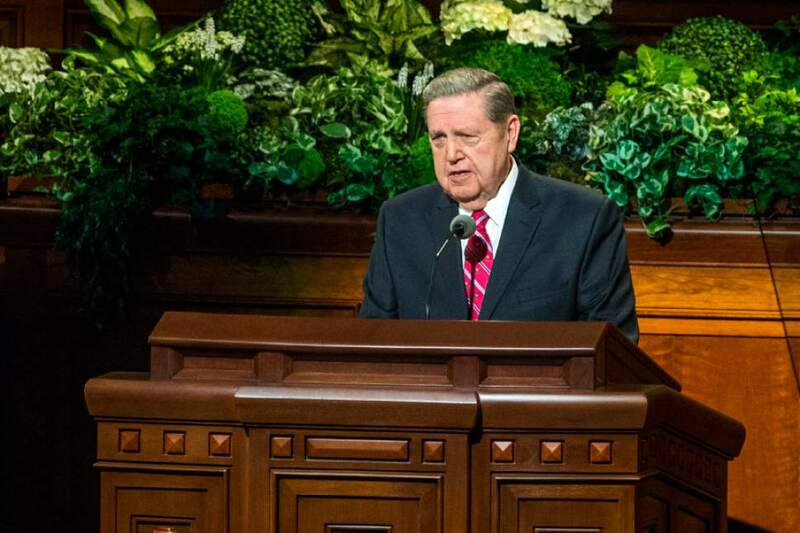 Chris Detrick | The Salt Lake Tribune Elder Jeffrey R. Holland, of the Quorum of the Twelve Apostles, speaks during the afternoon session of the 187th Annual General Conference at the Conference Center in Salt Lake City Saturday, April 1, 2017. 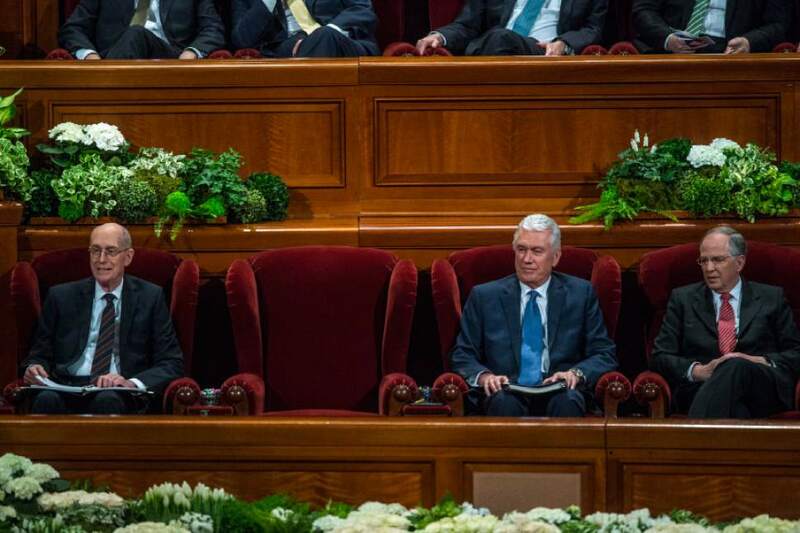 Chris Detrick | The Salt Lake Tribune President Thomas S. Monson's empty seat during the afternoon session of the 187th Annual General Conference at the Conference Center in Salt Lake City Saturday, April 1, 2017. 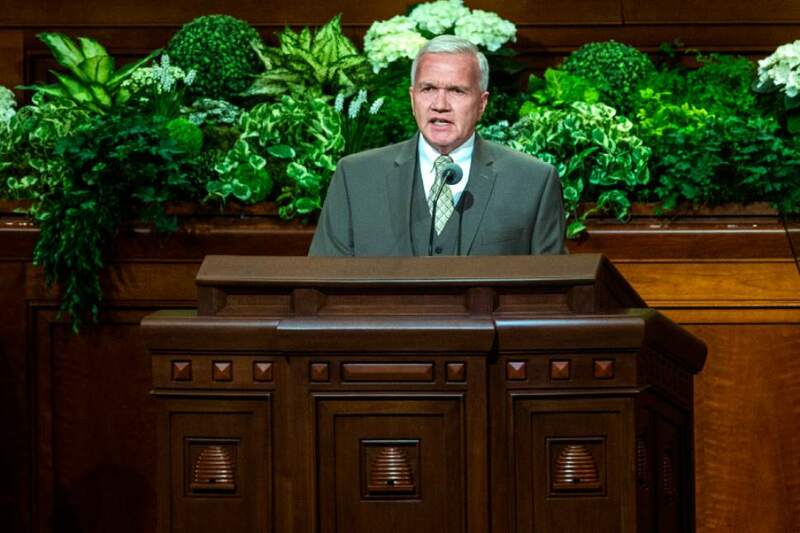 Chris Detrick | The Salt Lake Tribune Elder Neil L. Andersen, of the Quorum of the Twelve Apostles, speaks during the afternoon session of the 187th Annual General Conference at the Conference Center in Salt Lake City Saturday, April 1, 2017. 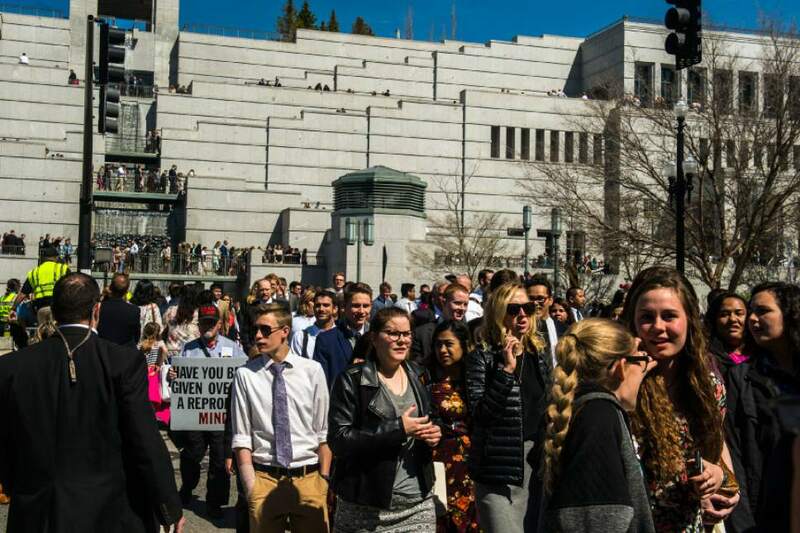 Holland was among more than a dozen speakers who addressed tens of thousands of Mormons in downtown Salt Lake City and millions more around the world, tuned into the LDS Church&apos;s 187th Annual General Conference. One voice the faithful didn&apos;t hear during the morning and afternoon sessions was that of LDS Church President Thomas S. Monson. The increasingly frail 89-year-old leader presided over the morning gathering after being helped to his seat. 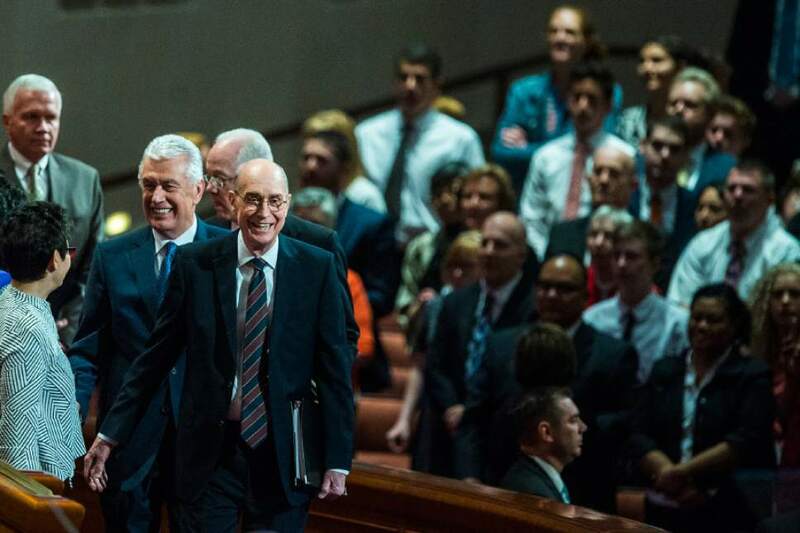 In the afternoon, that chair  between Henry B. Eyring and Dieter F. Uchtdorf, his two counselors in the governing First Presidency  sat noticeably vacant. 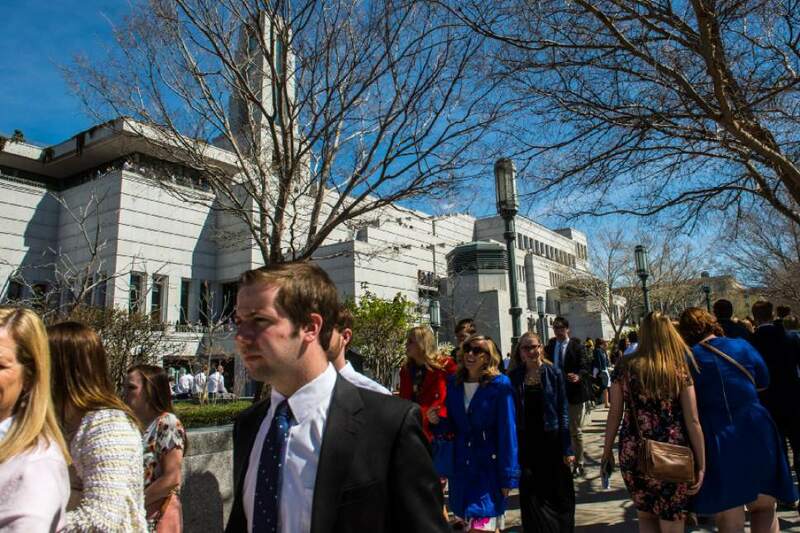 A spokesman for The Church of Jesus Christ of Latter-day Saints said Monson, viewed by Mormons as a "prophet, seer and revelator," was "conserving his energy" for the remainder of the weekend&apos;s sessions. Two years ago, the Utah-based religion announced Monson was "feeling the effects of advancing age." 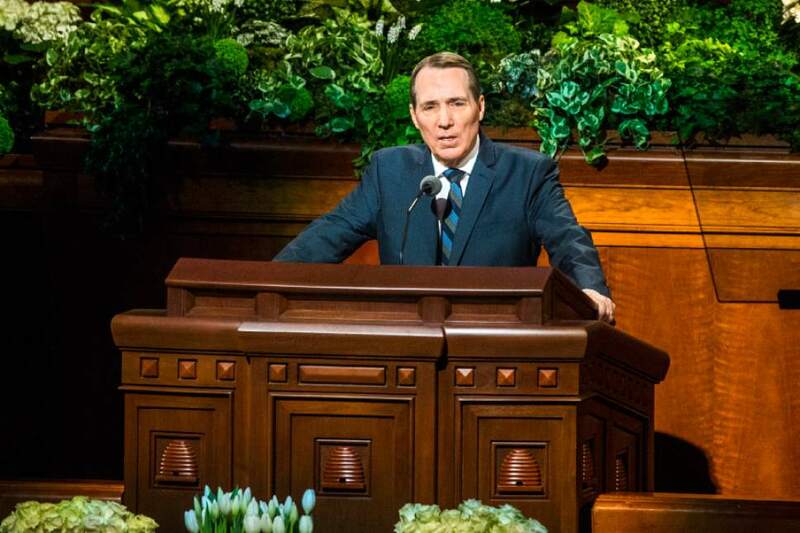 Since then, the longtime LDS leader, who also didn&apos;t attend last Saturday&apos;s women&apos;s meeting, has been scaling back his conference sermons. The former president of LDS Church-owned Brigham Young University pleaded with members to stay in the faith&apos;s expanding fold. During that time, he also witnessed the "ugliness of prejudice and discrimination suffered by those who are targeted because of their race or ethnicity." In LDS history, Mormons were persecuted for their faith, Renlund noted. "How ironically sad it would be if we were to treat others as we have been treated. ... Let us fully mirror [Jesus&apos;] love and love one another so openly and completely that no one feels abandoned, alone or hopeless." 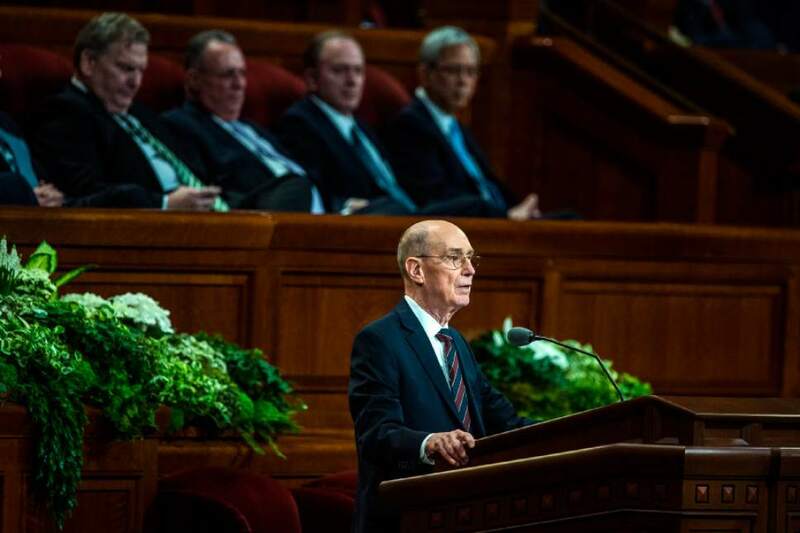 Eyring, who spoke first Saturday, addressed Mormons&apos; theological drive to seek out their ancestors  a practice they believe opens the door of the LDS gospel to long dead kin  and the growing fascination with genealogy among millions of others. "Interest in exploring one&apos;s family history has grown exponentially. At ever-increasing rates, people seem drawn to their ancestry with more than just casual curiosity," he said. "Genealogical libraries, associations and technologies have emerged around the world to support this interest." He said the "hearts of the children  you and me  have turned to our fathers, our ancestors. The affection you feel for your ancestors is ... deeply seated in your sense of who you are. But it has to do with more than just inherited DNA." The morning&apos;s concluding speaker was Russell M. Nelson, senior member of the Quorum of the Twelve Apostles and next in the line for the church presidency. 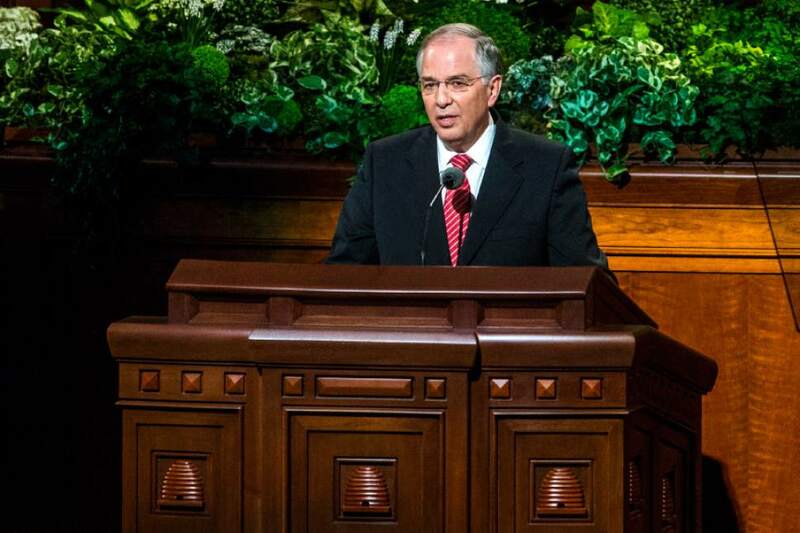 Nelson touted the power of faith to change lives. "True disciples of Jesus Christ are willing to stand out, speak up, and be different from people of the world," the 92-year-old leader said. Faith "propels us to do things we otherwise would not do. Faith that motivates us to action gives us more access to his power." When believers "reach up for the Lord&apos;s power ... with the same intensity that a drowning person has when grasping and gasping for air," Nelson promised, "power from Jesus Christ will be yours. When the savior knows you truly want to reach up to him  when he can feel that the greatest desire of your heart is to draw his power into your life  you will be led by the Holy Ghost to know exactly what you need to do." In the afternoon, apostle Neil L. Andersen emphasized the importance of "overcoming the world," rising above earthly concerns and focusing on God. "Overcoming the world is not a global invasion, but a private, personal battle, requiring hand-to-hand combat with our own internal foes," Andersen said. "The world, on the other hand, is more interested in indulging the natural man than in subduing him." One of those indulgences is social media. "A disciple of Christ is not alarmed if a post about her faith does not receive 1,000 likes or even a few friendly emojis," Andersen said. "Overcoming the world is less concerned with our online connections and more concerned with our heavenly connection to God." Fellow apostle M. Russell Ballard advised the faithful to set goals for their lives and make plans to achieve them, "within the framework of our Heavenly Father&apos;s eternal plan." The most important aims, he said, are "to return to [God&apos;s] presence and to receive the eternal blessings that come from making and keeping covenants." Ballard warned about "loud voices" used by Satan  including the mass media, the internet and social media  "that seek to drown out the small and still voice of the Holy Spirit that can show us &apos;all things&apos; we should do to return and receive." 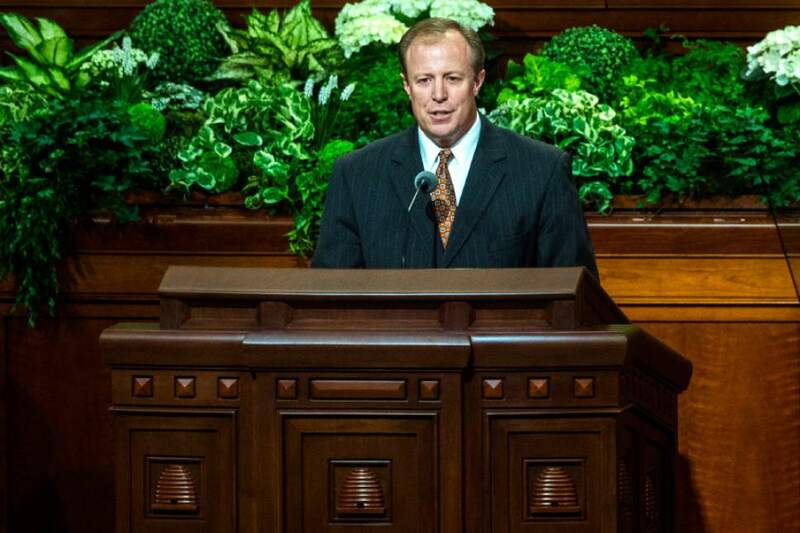 "We must keep the doctrine and gospel of Jesus Christ at the center of our goals and plans," Ballard said. "Without him, no eternal goal is possible, and our plans to achieve our eternal goals will surely fail." No women spoke Saturday, but three new female leaders were named to lead the women&apos;s Relief Society. Editor David Noyce and reporter Sean P. Means contributed to this story.